This was going to be my 100th skin, as it turns out it's my 105th. This is another one that has been quite a while in the making, but it's done now. It has quite a tech/futuristic feel to it, and I'm glad I finally got it to work as I really like it. 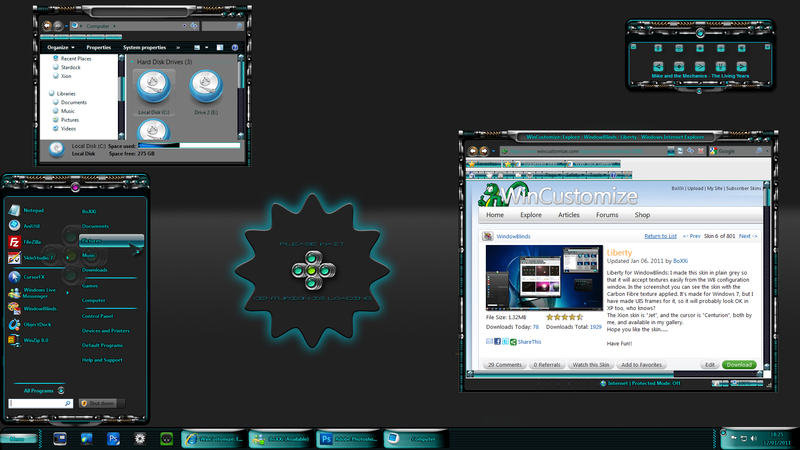 Again, this WILL probably work in XP, but no guarantees, it's really made for Windows 7. The start menu is animated, and so is the Xion skin that goes with it. Too bad it doesn't fully work on Vista. Startmenu animation fecks up the menu. hehe.... I never even thought about checking if that name had been used! I'm sure Harley won't mind. The best OS for my system. crazy skin boxxi.Keep up the good work.